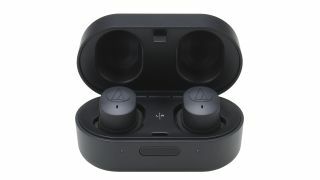 Audio Technica has lifted the lid on two new pairs of true wireless in-ear headphones, called the Sound Reality ATH-CKR7TW and the Sonic Sport ATH-SPORT7TW. Both headphones are designed to bring high quality wireless audio to your ears, as well as being able to answer and end calls, and control music from your connected Bluetooth devices. The Audio Technica Sonic Sport ATH-SPORT7TW headphones. Their ear pieces feature ergonomic Freebit ear fins for maximum comfort and they're certified with an IPX5 rating, which means they're sweat resistant and can even be rinsed under a tap. They also boast an ambient hear-through function, which you can switch on to give you the choice of hearing environmental sounds for safer use outdoors. They last 3.5 hours on a single charge and come with a carry case that can deliver up to 14 hours more power if you need it on the move. They're available for $199 (around £157.22/AUS$280). The Audio Technica Sound Reality ATH-CKR7TW headphones. The Audio Technica Sound Reality ATH-CKR7TW headphones have a great design with a 3D Loop Support so they stay secure in your ear, as well as button controls to easily handle phone calls, music playback and volume. They boast 11mm drivers with a carbon coated diaphragm that delivers faster response time and minimal distortion. The drivers also have machined brass stabilizers, which reduce unwanted resonances, as well as a stainless steel acoustic mesh resistor for improved high-frequency response. The ATH-CKR7TW deliver six hours of music on one charge, and come with a carry case that provides a further nine hours of use. They're available for $249 (around £196.73/AUS$350.41). The two new pairs of in-ear headphones will be at CES 2019, where we'll be getting a first look and hopefully a hands-on with Audio Technica's latest true wireless accessories.